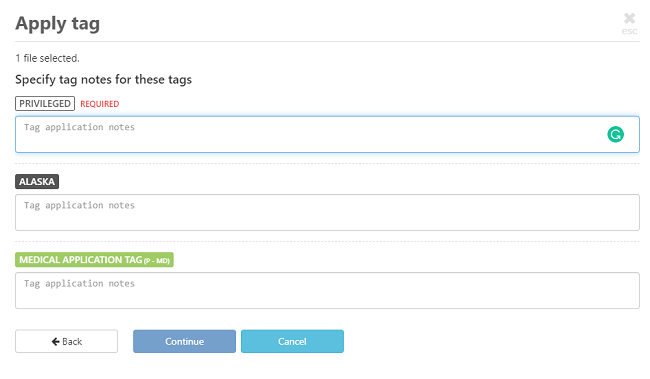 While tagging files in GoldFynch, you can attach ‘notes’ to the tags and quick tags you assign to files. This allows you to provide additional context for why a tag is being applied, or convey any other relevant information to the file(s). 4. (Optional) If you wish to make adding a note compulsory when a particular tag is added (e.g. PRIVILEGED,) check the Require that a note be specified. Tag will not be applied if a note is not specified. checkbox. Tag notes are assigned on an individual basis to files. That means that the same tag can potentially have different notes for each separate file it is attached to. However, it is also easy to apply tag notes in bulk - just select multiple files when you are applying the tag. 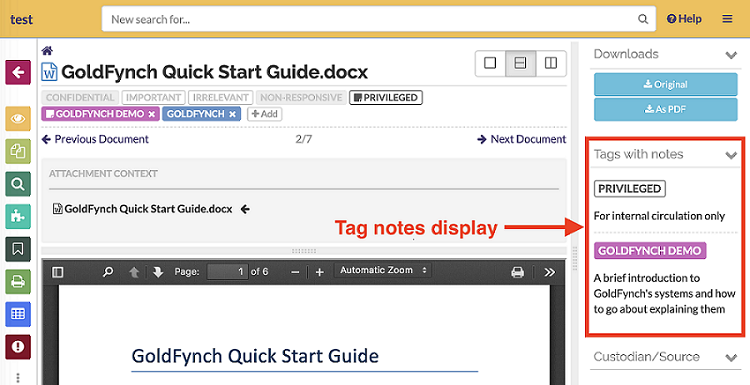 Once you have enabled note collection for a tag, you can begin adding tag notes to your files. There are many different screens across GoldFynch from which you can apply tags, and across each of them you will be given a prompt (as described below) when applying a note-collecting tag. 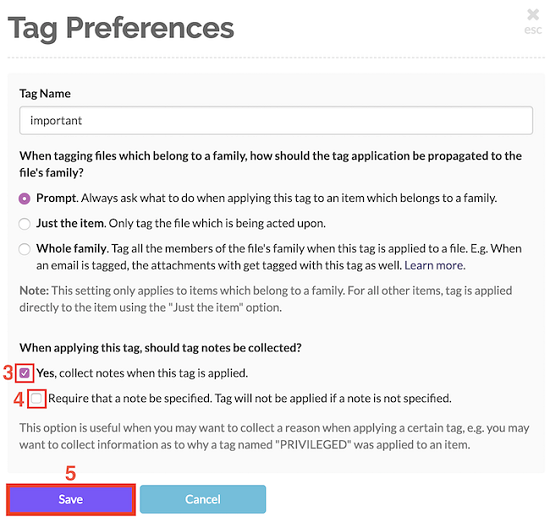 If you assign a tag that requires notes to a file, you will not be able to move beyond step 2 above until you enter a note; the Continue button will be unclickable. You will be able to tell that the tag requires a note by the REQUIRED text. NOTE: If you select more than one file while applying a note, all selected files which do not already have that tag with a note will be assigned the tag and the note you entered. Files which have notes for that tag will keep their original note. When assigning multiple tags that require notes, you will be able to enter a separate note for each tag. To view a tag note, just hover the mouse cursor over the tag and the note will be displayed in a window.